Not a cure of course, but certainly it is a useful tool to apply to the problem. Considering the side effects and costs of all the present protocols, getting a year's relief is great. It may also lead to something permanent. The tool kit now available for HIV is now surprisingly large and optimism abounds that a cure is both possible and perhaps sooner than appears obvious. At least victims are all now living out their lives in the developed world with some occasional damage and are actually drifting into old age and succumbing to other causes often not related at all. A team of Spanish researchers say they have developed a therapeutic vaccine that can temporarily brake growth of the HIV virus in infected patients. 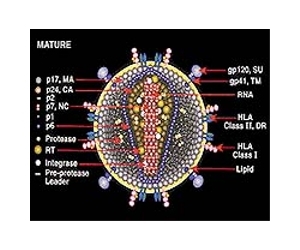 The therapeutic vaccine, a shot that treats an existing disease rather than preventing it, was safe and led to a dramatic drop in the amount of HIV virus detected in some patients, said the study, published Wednesday in Science Translation Medicine. After 12 weeks of the trial, the HIV viral load dropped by more than 90 percent among 12 of the 22 patients who received the vaccine. Only one among the 11 patients who received a control injection without the vaccine experienced a similar result. After 24 weeks, the effectiveness had begun to decline, however, with seven of the 20 remaining patients receiving the vaccine enjoying a similar 90-percent slump in viral load. No-one in the control group of 10 patients experienced such a decline in the virus. The vaccine lost its effectiveness after a year, when the patients had to return to their regular combination therapy of anti-retroviral drugs. Researchers said the results were similar to those achieved with a single anti-retroviral drug, used to block the growth of HIV. "It is the most solid demonstration in the scientific literature that a therapeutic vaccine is possible," they said in a statement. The vaccine allowed patients temporarily to live without taking multiple medicines on a daily basis, which created hardship for patients, could have toxic side-effects over the long term and had a high financial price, the team said. "This investigation opens the path to additional studies with the final goal of achieving a functional cure -- the control of HIV replication for long periods or an entire life without anti-retroviral treatment," the researchers said in a statement. "Although we still have not got a functional cure, the results published today open the possibility of achieving an optimal therapeutic vaccine, or a combination of strategies that includes a therapeutic vaccine, and could help to reach that goal," they said. The team said it took seven years to get to this point, and the researchers would now work on improving the vaccine and combining it with other therapeutic vaccines over the next three or four years. According to latest UN figures, the number of people infected by HIV worldwide rose to 34 million in 2011 from 33.5 million in 2010.